At HAIR LIFE the surgical transplantation of hair follicles is a remarkably simple outpatient procedure. Hair transplantation is a minor outpatient surgery that simply relocates hair follicles from the donor area to the balding site. The procedure first begins with the surgeon removing a donor strip from the donor site, which is located on the back or side of scalp. During the procedure, local anesthesia is administrated to relieve any discomfort. Our doctor will remove a strip of skin from donor area and close artistically. The donor strip is further cut into 3 sizes of grafts- the micro graft, the single follicular unit, and modified follicular unit. The micro graft has 1 hair; single follicular unit has about 2 hairs; and the modified follicular unit has 2 to 4 hairs. The surgical graft technicians then isolated individual hair follicles from the donor strip and implant them into the graft region. The grafts are inserted into per-cut micro and mini slits that are strategically designed to aesthetically improve the density of your existing hair, lower the hairline, and fill in the balding areas. GETTING FROM WHERE YOU ARE NOW TO A WHOLE NEW YOU IS NOT AS COMPLEX AS YOU MIGHT THINK. 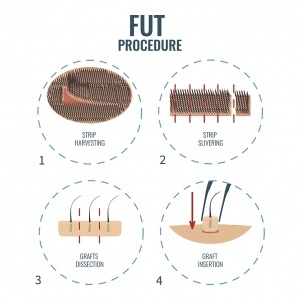 There are really just 4 steps to getting a hair transplantation procedure at HAIR LIFE. Our experience makes for a low stress, organized, and results-driven process. We have outlined the four steps here so that you can see just how easy it is. You meet with HAIR LIFE counselor who will provide you information regarding to causes of baldness and hair transplantation options. You will see patient photos, their contacts and more material about hair transplantation procedure and cost ranges. Each counseling session takes approximately 1 hour. Its FREE and EASY! There is no cost and no obligation to see HAIR LIFE counselor. It is the first step in helping you decide if a procedure is right for you. Before any treatment our physician will discuss your hair loss with you and perform a thorough examination of your thinning areas to determine your actual baldness classification. After the examination he will determine your candidacy for a hair transplant and recommend a hair transplant plan that is tailored to your needs. There is no cost and obligation to see HAIR LIFE physician. It is a necessary step for procedure. Follicular unit transplantation is a procedure where hair is transplanted from areas at the back and sides of the scalp, and moved to balding areas of the scalp. The patient is anesthetized and a doctor removes strips of tissue from the donor area, and, once extracted, the donor strip is cut into individual follicular units. The doctor then makes tiny holes in the scalp, where the follicular unit grafts are carefully placed. The placement of the grafts is usually done by a team of nurses or healthcare assistants. The donor strip is processed under a microscope, allowing the precise extraction of graft units. Individual graft units ready to be transplanted. On completion your hair transplant procedure, simply you go home and rest for the evening. Most patients can perform activities immediately with exception of strenuous exercise, which should be avoided for two weeks. After 48 hours you can wash your hair using a special method that we teach. For more information about the hair transplant procedure, please visit our office with out any cost.